Superman, now transformed into a male version of Cheetah, begins acting like a wild animal. He attacks the Justice League. Heat vision causes a ground explosion at the feet of Cyborg and Aquaman. Superman then puts a choke-hold on Wonder Woman; but it is fleeting, so she is able to resist it. Hara, the leader of the San Tribe, the indigenous tribe that is indirectly responsible for Barbara Minerva's transformation, blows a horn that causes Superman pain and immobilizes him. Cyborg is able to mimic the sound and keep Superman under control for the time being while they figure out a more permanent solution. Hara says rather cryptically that Barbara Minerva must die so that Cheetah can be saved. Batman, the de facto leader of the Justice League, begins barking orders to the team. Cyborg should stay with Batman, while the other members should find and capture Cheetah. Wonder Woman is reluctant to leave Superman while he is in this condition; but Batman says she can best help him by bringing Cheetah back. Wonder Woman is the right person for that job, because she knows Cheetah better than anybody. Flash finds Cheetah; but she is able to again slash his calf. This time it is a deep wound; going clear to the bone. This slows him down; but Flash insists he will stay in the fight and help snare the Cheetah. When Flash asks what the plan is, he is told that Aquaman wants them to drive Cheetah to the east. Hara has an antidote for Superman's condition. Batman, indicating how very important Superman is to the world at large, and to him personally as a close friend, asks Hara to reassure him that the antidote will work. Hara confirms that the medicine will save Superman. As Flash approaches Cheetah, she is amazingly fast enough to slash him across his chest, creating a deep wound and causing severe pain. Wonder Woman begins to pummel Cheetah, still insisting she can help free Barbara Minerva from the curse that has transformed her. Batman interrogates Hara, and is told that Cheetah has been hunting the tribe members because they want to kill her. Hara tells him this story: For centuries, the San Tribe members have hunted alongside various Cheetahs. Each generation, somebody new was chosen to serve as host body for the Goddess of the Hunt, the Cheetah. Hara's mother was the previous host, and was killed by a man wielding a knife known as the Godslayer. This knife has magical powers that made it effective against Cheetah and the various other deities it has been used against. But this time, instead of dying, the Goddess of the Hunt was able to inhabit the Godslayer; which eventually was used to accidentally transform Barbara Minerva. So now they must kill Barbara Minerva so that the Goddess of the Hunt will take a new host body, and the Cheetah will again hunt alongside the San Tribe. Wonder Woman and Cheetah are still fighting. Cheetah momentarily gets atop Wonder Woman, who uses her powerful legs to flip Cheetah head over heels and off the cliff where they are grappling. Cheetah falls down and into the water below, where Aquaman is waiting with a school of nasty-looking piranha fish with razor-like teeth and hungry appetites. Aquaman is now in his element, and easily subdues Cheetah. Later, after they have put Cheetah in a cage at Belle Reve Penitentiary, Wonder Woman approaches and speaks to her. Barbara Minerva says that she is the bad one, not the Cheetah, and that not everyone can be saved. After Diana leaves, Barbara begins communicating remotely with some criminal colleague, and asks to be notified when Black Manta arrives. When Diana reconvenes with other League members, Batman speaks to her about Barbara Minerva. Batman and Cyborg have been doing some research. Barbara Minerva has a long criminal record. Cheetah, did not corrupt Barbara Minerva. Batman is clear. It was Barbara Minerva who corrupted Cheetah. Wonder Woman and Superman find some privacy in the Watchtower, and have a discussion about what has happened. Wonder Woman is very upset that it was Barbara Minerva who turned out to be the bad apple. Wonder Woman says she was naive, not perceptive; and is really beating herself up about it. Superman says that Wonder Woman failed to judge Barbara Minerva's true criminal nature because Wonder Woman tries to focus on the good in people; something Superman tries to do regularly. She insists that this episode has caused her to have trust issues. When Superman asserts that she has a whole team she can trust, especially him; she replies that she would like to know him better. Moments later, Wonder Woman and Superman are sitting in the Smallville Diner eating pancakes. This has caused quite a stir, as everyone is staring at them, both inside the diner, and outside through the windows. Superman says he brought Wonder Woman here to meet the kindly couple that runs the diner, and the nice folks who regularly eat there. He says "This is why I'm Superman". They walk the fields on the Kent farm, talking about life, good and evil, stuff like that. He says that when they fight Darkseid, David Graves, and many others, these are the good people he is protecting. The good people of Smallville and many, many places just like it. 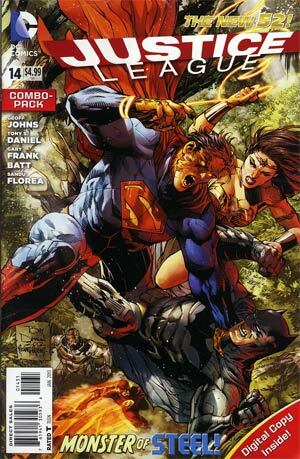 Diana wants to meet Clark's parents, and is told that they have been deceased a long time. Superman tells Wonder Woman not to get jaded by all the evil and corruption they regularly confront, because there are so many good people. They walk hand-in-hand, and then stop to gaze into each other's eyes, which leads to another passionate aerial kiss. While they are focused only on each other, something lands on Superman's shoulder. It is glowing, and looks almost like a tiny Green Lantern ring. Is it an eavesdropping device? Or something else? They continue to kiss as the camera fades back. Story - 5: I loved this issue. Going into this two-parter, I did not think that Cheetah was powerful enough to bother the Justice League for very long. And indeed while she was certainly more than a mere distraction, Cheetah is not nearly in the same category as some of the other extremely powerful foes the Justice League has already tangled with, such as Darkseid. But that is OK. Not every threat has to be on a planetary scale. We see that Cheetah is fast enough to use her claws on Flash and draw blood, agile enough to engage Wonder Woman in hand-to-hand combat, and filled with enough magic to allow her to pierce Superman's skin. Thus she is a powerful enough adversary to dare take on the entire Justice League and actually keep them occupied, at least for a bit. I loved the teamwork they used to take Cheetah down. Aquaman tells the team to draw Cheetah to the east. Wonder Woman uses an acrobatic maneuver to send Cheetah hurtling to the appropriate spot, where powerful Aquaman is waiting underwater. He is certainly strong enough to easily hold her in place while her air runs out. Nicely done! We learned a lot about Cheetah. We learned her origin for the New 52. I found it interesting that Barbara Minerva is just the next in a long line of Cheetahs going back for generations; and that all previous Cheetahs were members of the San Tribe. Because Barbara is outside the tribe and rather independent-minded, she is not assisting them in any way. So they are attempting to kill her and thus return to the status quo. This causes her to hunt them down in self-defense. I found this whole explanation to be logical and well-conceived. We also learned that it is Barbara Minerva who is the bad apple, not the Cheetah persona who lives in her host body. This is the larger point, because it causes Wonder Woman to doubt her instincts and to have trust issues. But this becomes an opportunity for Superman, who shares his very optimistic view of mankind with her. This discussion is precisely what Diana needs right now; and she is drawn even closer to Superman. Wonder Woman wants to meet Clark's parents. Unfortunately, they are not available for a face-to-face with Wonder Woman. Too bad. I regret that the Kents have passed on in this interpretation of the mythos. Maybe we need a reboot... Just kidding, just kidding! This two-part story begins with Superman and Wonder Woman in a passionate embrace, and ends the same way. It appears that their dates, discussions, and meaningful encounters will play out in these pages. Yay! Art - 4: Tony S. Daniel does a solid job. I love the splash page showing Wonder Woman and Cheetah in hand-to-hand combat on page 8; and also the splash with Aquaman subduing Cheetah underwater three pages later. Black Adam and Doctor Sivana are in New York City, looking down from the top of a skyscraper. Doctor Sivana says he needs magic; but Black Adam indicates the magic is still hidden wherever the Wizard put it. Black Adam, with Doctor Sivana in tow, swoops down to the street level. He sees labor protesters walking a picket line, and misunderstands the situation. Comparing the CEO to the ancient pharaohs who lived off slaves, Black Adam flies to an upper floor of the skyscraper, grabs the CEO, and casually tosses him to his death below. The bystanders are far from grateful, which puzzles Black Adam. Black Adam grabs Doctor Sivana and flies to his tomb. Sivana uses his magic to spot the Rock of Eternity, although the magic causes him to react in pain. Black Adam surmises that the Wizard has chosen a new champion. We switch scenes and see Shazam and Freddy grabbing a trenchcoat for Shazam from a clothing shop. Black Adam and Doctor Sivana head to the home of an old friend. The friend has had his memories purged by the Wizard. He is Sloth, one of the Seven Deadly Sins. Black Adam wants Sloth and his brothers and sisters to help him find and defeat the Wizard's new champion, and then tear down the world so that Black Adam can rebuild it to his liking. Story - 3: Things are building towards the inevitable moment when Black Adam meets Shazam. That should happen next issue. This story is OK, but I liked the stories better that featured Billy Batson trying to adjust to living with his new family. This feels like a transition issue, and is mostly about Black Adam. Things should heat up next issue when we see the initial confrontation between Shazam and Black Adam. Art - 3: Gary Frank is a good artist. But Brad Anderson's colors seem kind of dark this issue. No images stand out for me. Cover Art - 3: Superman has been transformed into "Super-Cheetah". The other Justice League members are trying to get him under control. This is a good action shot; but the backgrounds seem "muddy", making the cover look crowded. 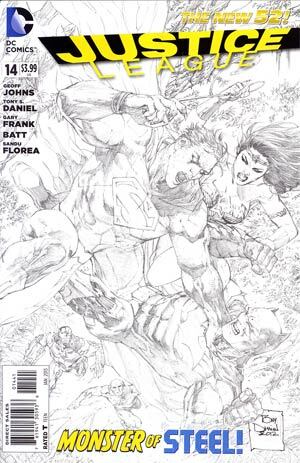 Cover Art (Variant Edition) - 4: We see Wonder Woman and Superman together, in the split second before they leap into action. 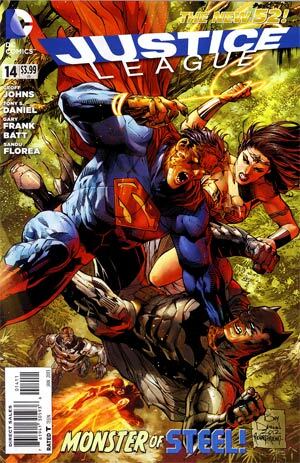 As on the cover of Justice League #12, the lasso is twisting and flying about wildly, as if in a dance. 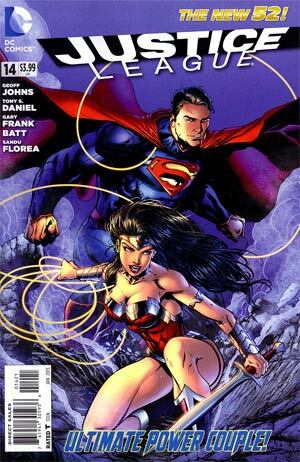 The lasso seems to reflect Wonder Woman's jubilant mood. The text underneath says "Ultimate Power Couple". I prefer this cover to the original.